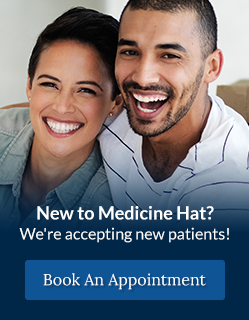 The dentists at River Dental in Medicine Hat, Alberta offer orthodontic treatment and Invisalign® to help you create a healthy smile. When you think of braces, you may think first of children. And it’s a fact that many children between the ages of five and ten need braces to correct problems like wide spaces between teeth, badly aligned teeth, overlaps, and clicking jaws. In some cases, early treatment will prevent future problems. Each patient and case is different, and your dentist will work with your child to determine if two-phase treatment will benefit their individual case. Early treatment can, in some cases, prevent future surgery. Choosing to straighten your teeth is a big decision that affects not only your appearance, but your lifestyle as well. Straightening your teeth with Invisalign® at River Dental is one method of treating common orthodontic problems affecting both teens and adults. Straight teeth not only provide a confident smile, but can also contribute to healthy gums, reduce your risk for tooth decay, and improve overall dental and general health. Invisalign® can solve a range of issues, including overly crowded teeth, widely spaced teeth, overbites, underbites, and crossbites. Invisalign® treatment is a technique that straightens your teeth without braces, using a series of clear, removable aligners that are custom-modeled to fit your teeth. The molds of your teeth are created digitally using iTero scanning technology. The Invisalign® aligner trays are made of smooth, comfortable plastic that you wear over your teeth. Wearing the aligners will gradually and gently shift your teeth into place, based on the exact movements your dentist plans out for you. There are no metal brackets to attach and no wires to tighten. The best part about the whole process is that most people won’t even know you’re straightening your teeth. The dentists at River Dental have been providing Invisalign® to our clients for over 10 years. Although not all teens and adults are candidates for the Invisalign® aligner system, we will provide a comprehensive assessment to see if the Invisalign® system is right for you. Please contact our office to schedule a consultation. *Each and every patient is an individual and therefore individual results may vary. The dentists at River Dental do not necessarily subscribe to the treatment claims made by the orthodontic manufacturers. Interested in Invisalign®? Contact our office today to book a consultation!